Two world-class artists combine their talents to create new solo and duo works for this special New Mexico concert. 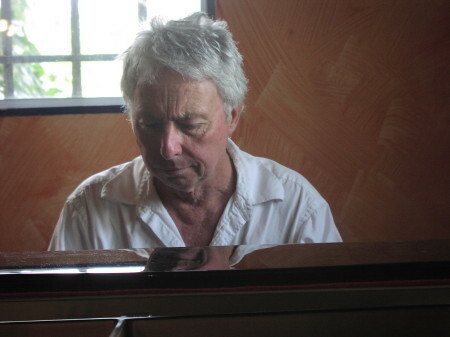 Harold Budd (piano, voice) has taken minimalism in a lush, sensuous direction all his own. A major link between the worlds of contemporary composition, art rock, and “ambient”/“new age” music, Budd’s career as an art music composer has been highlighted by over 15 albums, both solo and collaborations with the premiere artists of avant garde pop music: Brian Eno, Cocteau Twins, Bill Nelson, Andy Partridge, Hector Zazou, John Foxx, and others. He was a principal figure of the West Coast avant garde of the sixties and the seventies, where his artistic language evolved from minimalist to aesthetic and decorative. Since the early eighties, Harold Budd has crafted a style and technique unique to his own art: partly improvisatory, partly intellectualized. He works like a painter, thinks like an architect, edits like a poet, and makes music. Jon Gibson (saxophones, flutes) is a composer, multi-wind instrumentalist (saxophones, flutes, clarinets) and visual artist who has taken part in numerous landmark musical events over the past three and a half decades, performing in the early works of Steve Reich, Terry Riley, LaMonte Young and Philip Glass, with whom he continues to perform in various configurations. His music can be heard on the New Tone, Point, Lovely Music, EarRational and Einstein labels, and he appears on recordings by Glass, Steve Reich, Frederick Rzewski, Arthur Russell, Annea Lockwood, Peter Zummo and Robert Ashley. His visual work, which is closely related to his music, has been exhibited in solo and group shows throughout the world and manifests itself in various media, including drawings, videos, books, and prints.